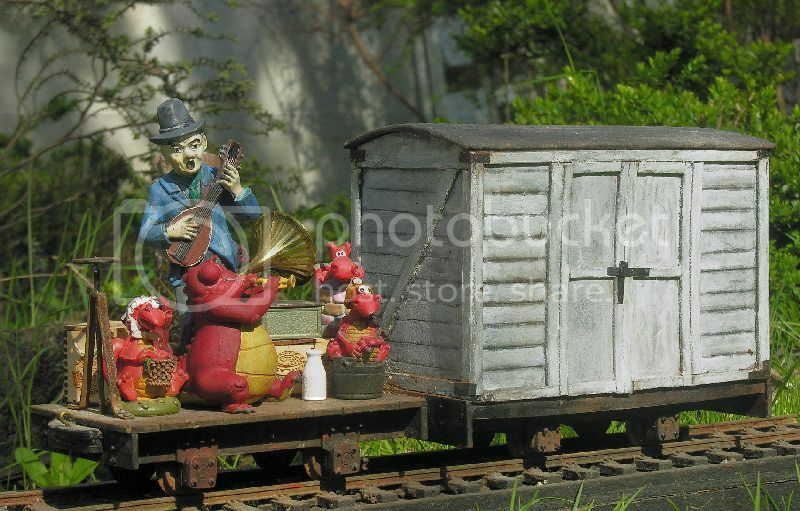 Igor hammered a new wagon together for Frau Van Schneider, widow of Admiral Schneider and sister of Lady Sybil from Ankh-Morpork. 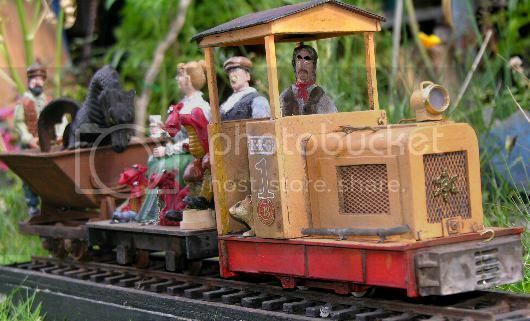 Its time now, to think about building or aquiring a 7 / 8th locomotive. The kit and the standing figure was supplied by Banjomike / UK. You can find him at the SE Lounge. The loco runs on a lipo batterie and Deltang RC. Meet the new employee. Not Frank Zappa, but Wilhelm von Homburg, an ex-wrestler, boxer and mouvie actor. 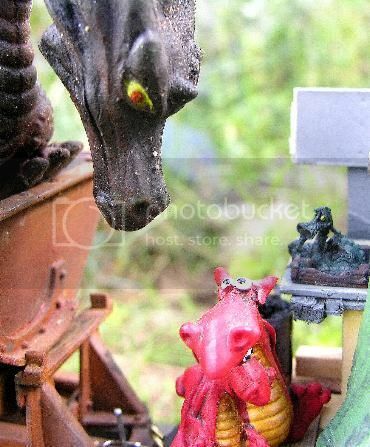 Of course, Diesel the Station Cat, takes a ride with the dragons. Found the dragons at various Souvenirshops in Wales and brought 10 of them to Germany. The swamp dragon idea is based on some Terry Pratchett Disworld novels. Lady Sybil runs an asylum for homeless dragons. Aw man, been ages since reading Discworld series. Might have to change that. Like the photo of the fellow with the mallet. I dunno, dragons and trains just seem to be a natural fit, can't define why, they just do. 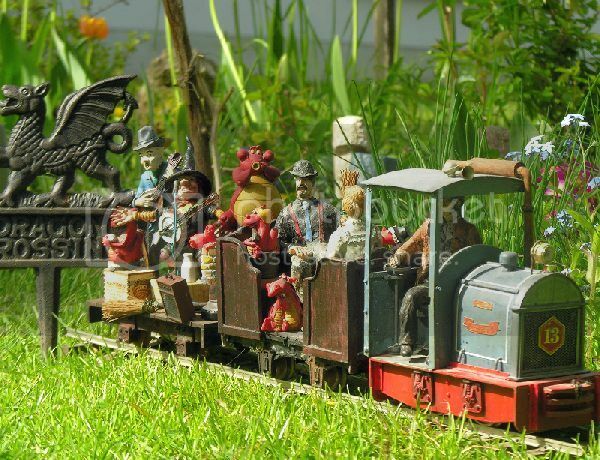 Steam locos are sometimes referred to as 'steam dragons'. 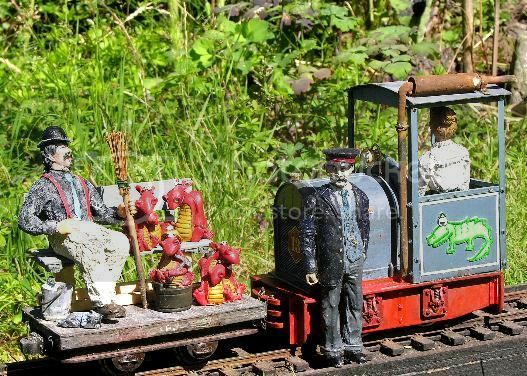 Those little dragons in the Ivor the Engine films are very charming. Actually no layout should be without some. Dragons come in all seizes. 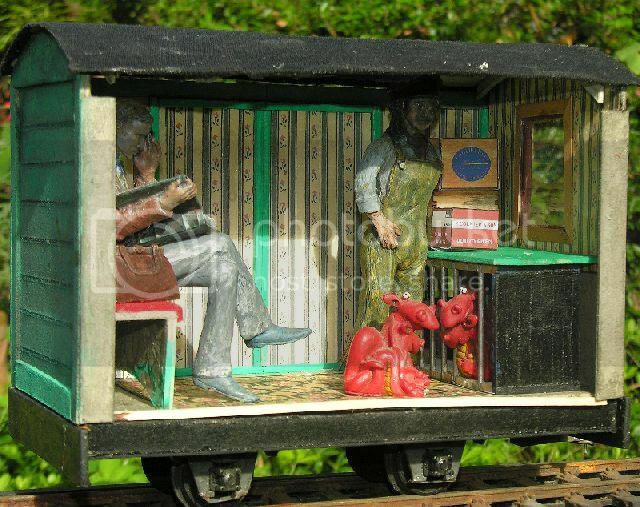 A very small one is Erroll, who plays a major role in T. Pratchett´s "Guards, Guards"
The 7 / 8 th scale loco was build from a cardboard kit (printed and distributeted in the UK) http://www.rail-roadmodels.co.uk/#!product/prd1/560795911/7-8-scale-chunky-diesel It runs on batteries on a cheap Houstoun Locomotive Works drive. 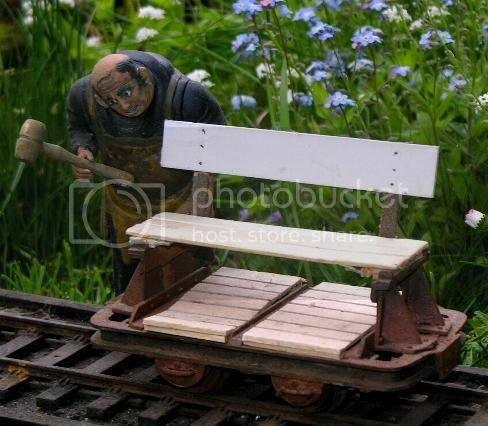 The flatcar behind the loco is a lasered MDF kit from Houstoun..... It is supposed to be in 19 mm scale (1 : 19), but the dimensions look OK with my 7 / 8th stuff. Last edited by KEG on Fri Jul 24, 2015 7:18 am, edited 1 time in total. Great work and very good looking dragons! Can't beat it. I have communicated with HLGW folks and they are considering GN15 stuff also. We shall see. We tried to teach them "Puff the Magic Dragon", but they prefer "Highway to Hell"
Juergen, Today I managed to capture a pair of newly hatched south western US swamp dragons. Swamps are rare in this area, but there are some. Hot springs keep them snuggly for young dragons during the hatching process. These critters are more lizardy looking than the european species. They are obviously quite hungry, but we have discovered that they like raw hamburger and scrambled eggs. Very strange US dragons. 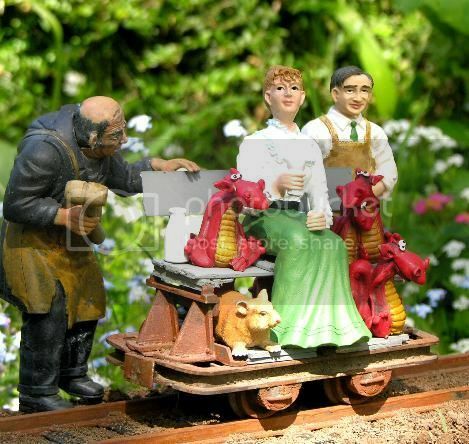 So how will you transport them so they will fit in a thread dealing with 1 : 13 scale dragon transport? 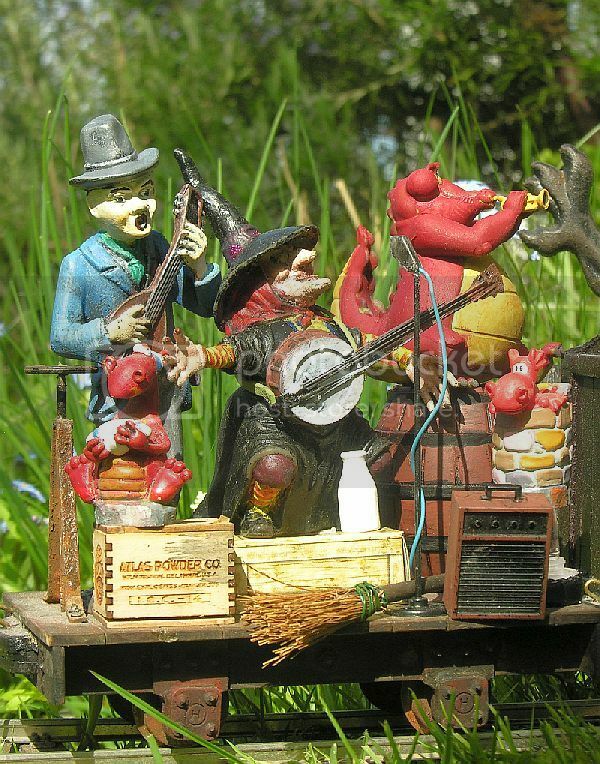 Annother artist showed up at the Swamp Dragoon Asylum. Gytha "Nanny" Ogg from Lancre. 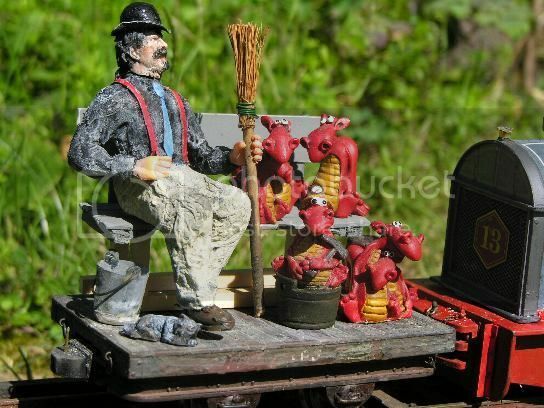 When building a good / guards van for the Swamp Dragon line, I decided to add a dragon compartement. 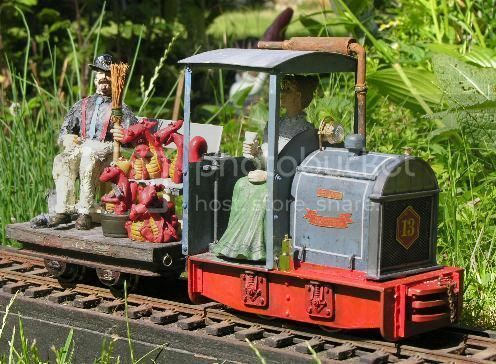 Some railroad companies had these for dogs. Nobody wants to have smelly dogs in coaches next to them. 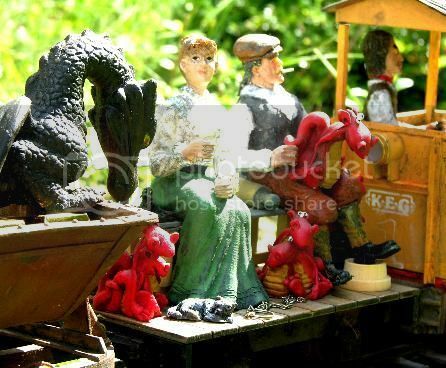 The dragons chewed up one of the cage bars and can move freely all over inside the waggon. The model was constructed more or less from 2 / 3 mm cardboard, some coffe stir sticks and larger matches. Quite a few details are still missing. 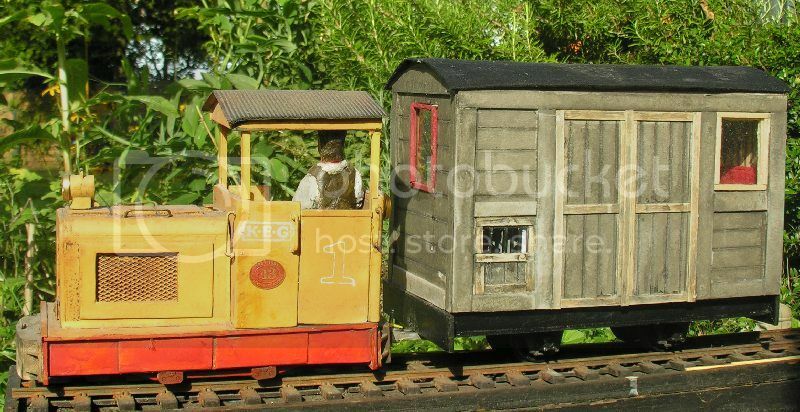 Have not yet decided, what colour I will paint the wagon.